Throwing is the process of creating dishes on the wheel. It's messy, absorbing and very addictive! It's a challenging process, but this workshop only takes three people, so you get close tuition from a very experienced teacher. Perfect for complete beginners to pick it up and have a go or for anyone wanting a little more practice or help with a new technique. At the end of the workshop, you can choose one of the studio glazes for your favourite dish. 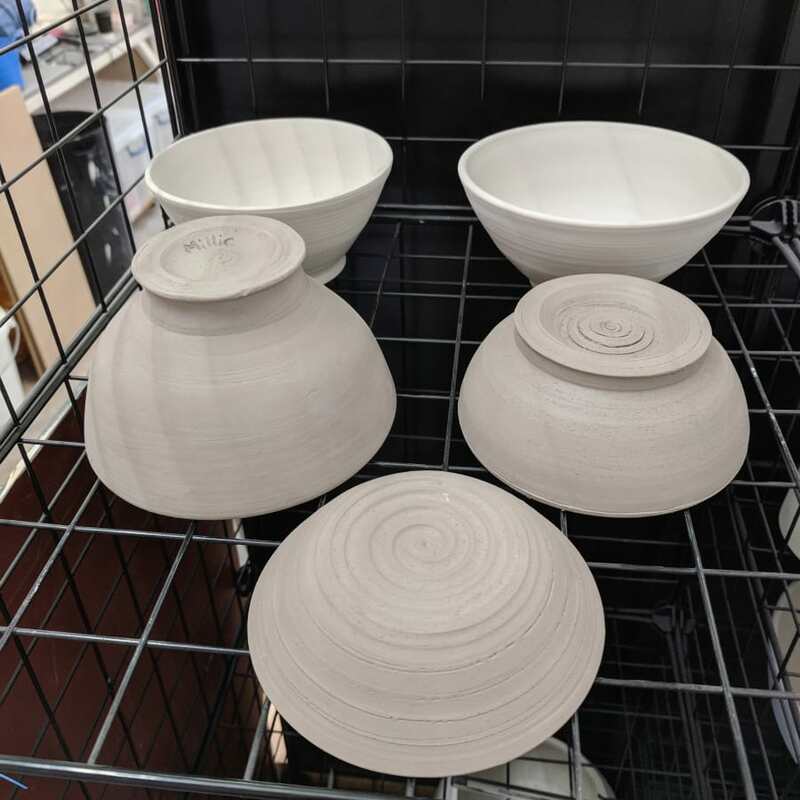 The clay and glazes we use here are strong and durable, so your finished pieces can be used just like everything else in your kitchen and are dishwasher and microwave safe. 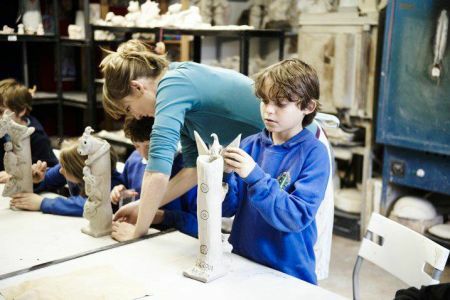 After the workshop, your finished pieces will be thoroughly dried, glazed and twice fired. We have visitors from all over London and the UK, so we include a delivery service in our workshops. We use a specialist courier to package and post your work to make sure that they arrive in perfect condition. Your pieces should reach you around three weeks after your workshop and you'll receive tracking details so that you can make sure it arrives at a suitable time. You may spot that we mark the bottom of your bowls with your name and a studio stamp, but you can also add your own dedications or dates during your workshop. I absolutely loved this class! The studio is part of a larger shared artists space (Kindred Studios) which is based near Maida Vale and super easy to get to. When I arrived Odile had a cup of tea brewing, and I had a chance to have a look around before the class started. The studio itself is really lovely and bright, and gives such a great insight in to the inner workings of a full time ceramicist. 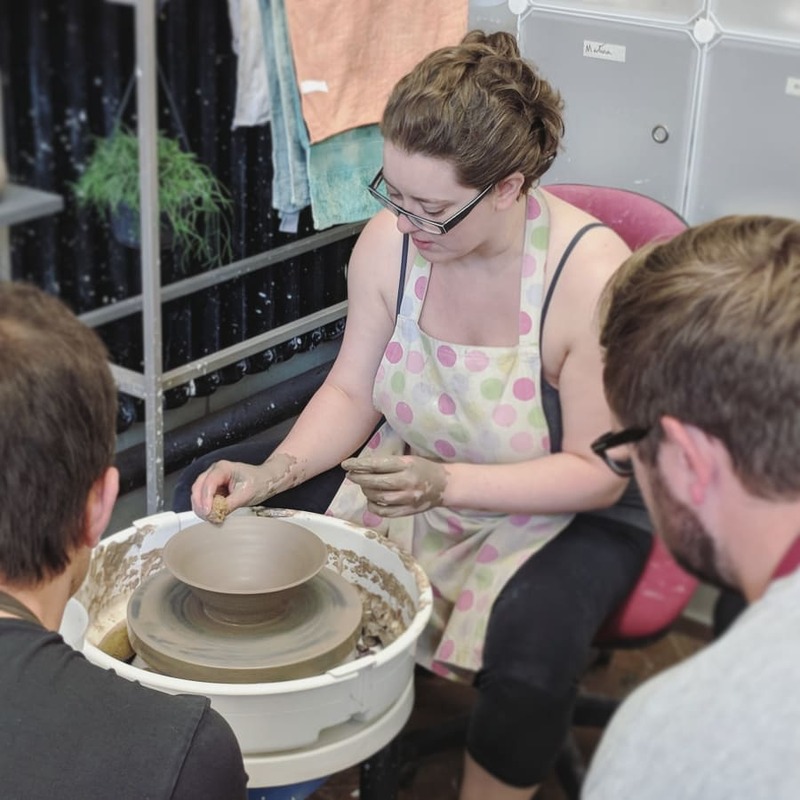 The class started with such an expert demonstration from Odile that I thought I would be picking up the wheel throwing in no time, little did I realise that her skills make it look a lot easier than it is (it's also totally mesmerising to watch)! We then spent some time cutting and shaping our clay into usable pieces ready to start throwing on the wheel. Of course this was my favourite part of the workshop, and after a few failed attempts, and lots of help and patience from Odile, I finally got the hang of it (I think!) and managed to create a bowl that I was incredibly happy with. It's such a great feeling of accomplishment, and I can't wait to see the bowl once it's glazed and fired. Something I didn't know, glazing is basically like a light coat of paint, and Odile gave us choices on the colour - bonus! I left the studio with a big smile on my face and have definitely got the pottery bug. Thank you so much to Odile and Obby for the perfect Sunday - 5 stars!!! It was a really great workshop, and as it was a small group we were able to get a lot of help and attention throughout. Would definitely recommend to anyone wanting to try out the pottery wheel and have a little Ghost moment! Enjoyed the workshop tremendously, the teaching was very clear and personal. Workshop is big, airy, wonderful environment to learn pottery. Would definitely signing up for more! The course was intimate and a lot of fun. I definitely recommend it! The workshop was really great! 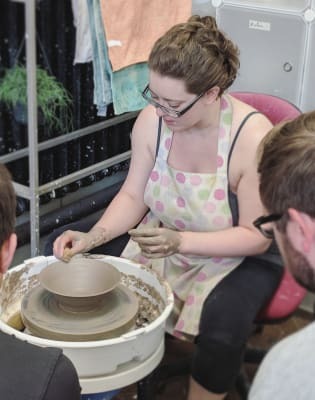 Would highly recommend this workshop for anyone wanting to try out the pottery wheel! It was such a great class! Definitely suitable for beginners . Odile is very patient and a great teacher. Really easy to follow and a lot of fun! Perfect for beginners! I went on my own and had such a good time - I love my bowls and use them all the time! Odile is a fantastic teacher. There are only 3 people in total so she's able to give great individual attention. Odile teaches you how to get started using a pottery wheel and how to shape a bowl, which she will glaze and send to you. We had such a fun afternoon and despite our intial misgivings that we would make a complete mess, we made two pots that Odile is kindly glazing and posting to us.It was our first time using a pottery wheel, however Odile, with her initial demonstration, made it all seem so simple. She then guided us through the process step by step, giving assistance and encouragement when needed and making the experience throughly enjoyable and positive. Odile is welcoming and friendly and we would definitely recommend her workshop. Both of us would like to go back to have another go! Enjoyed the workshop very much. Learnt a lot of throwing techniques and had sufficient time to practice the skills. Highly recommended. Odile' pottery wheel class was absolutely superb. I can't thank her enough for the best fun I've had in ages. I came away feeling over the moon at having started learning a new skill in the most relaxed and supportive environment. Odile is a truly wonderful teacher and is brimming with expert knowledge, enthusiasm and encouragement. Her passion for her work really shines through. Thank you Odile - I will definitely be returning very soon. This workshop was great - really fun and rewarding. It was a class of three so we each got a lot of one-on-one attention. It's harder than it looks but Odile was great at guiding me through the steps. Can't wait to see my glazed pot! Odile’s workshop was so much fun! Odile was super friendly, a fantastic teacher, informative and fun. The venue is an old college turned into creative studios which is a really nice idea! I’ve never worked with clay before and made my own bowl! I would highly recommend and definitely return for more workshops. Very friendly hosting coupled with an amazing time learning how to make our first piece of pottery and will not be our last! Great class, really enjoyed it, Odile was very friendly and made sure we all had something made by the end of the class! Looking forward to receive our pieces! Great workshop - Odile is a wonderful, patient teacher and explains everything really clearly. It is a very relaxed class in a lovely bright, airy studio. Would highly recommend! My partner and I had so much fun centre-ing and throwing on the wheel, making our own breakfast/pasta/salad bowls. We are so excited to see the glazed and fired products in a few weeks' time! Odile is an amazing tutor and an impressive artist and potter. She gave very clear instructions, was incredibly patient, and extremely encouraging. Odile was also fantastic at meeting her students at our different experience levels and making sure that we were all able to achieve our goals for the lesson. We had a such a wonderful time today and will definitely be back for more lessons! Place it self was very cute . Odille was amazing with instructions , it was super easy to follow and make stuff. Definitely going back to learn more. Odile was a thoughtful and helpful teacher who took time with each workshop participant one-on-one. The class was great value and I would definitely come again. Her studio is beautiful too! That was very interesting experience! thank you, Odile! Makes a brilliant cup of tea and has a great simple method of explaining how to work on a wheel. Classes are a good size which means everyone gets help. I can't wait to see the end result!!! Thank you Odile for this really relaxing moment. Looking forward to do it again. Lovely idea for a date. Small teaching group. Great session! Definitely would recommend. Fantastic time at this workshop - I just wish I had longer to spend on the wheel. Odile was a great tutor and I can't wait to see the bowls we produced. Such a nice surprise to walk into the class and find out that it was only for myself and another person. With such a small class it was really easy to develop the skills quickly. Odile was friendly and supportive. She gave clear demos and instructions. Really nice way to spend a weekend. Highly recommend! Odile was a perfect teacher, very patient and gave a couple of demos so we could really get to grips with the process of using the wheel. She guided very calmly and stepped in to save the day when things start to go pear-shaped! Beautiful studio and surroundings. Will definitely go back again! A very enjoyable class that has given me the bug! We used the wheel to make a bowl or two and it was great fun. A lot harder than you think. Odile was very friendly and with only 3 people in the class you get lots of attention! Odile finishes off the bowls and will send to us in 3 weeks, I can't wait to see my creation! I only wish it was longer as time seem to fly! Brilliant session & great tuition from Odile who is really friendly. The small group size means its almost 1:1 guidance, which is a bonus. The space to work is lovely too. Definitely would recommend it. We were enjoying it so much, the only disappointment was with how quickly the time flew by! Great experience with Odile. 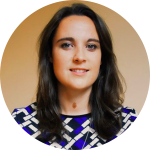 The slot was created for us and as soon as we arrived Odile was welcoming, a great teacher and was both informative and interactive. 90 minutes later I was only left wishing we had longer. Would recommend to anyone! I learned how to work with clay on the wheel: how to form it and dry it ready for firing. I was blown away with the bowl I made. It was brilliant. Odile is an amazing teacher with such a gentle calm manner. I loved the workshop ! The pottery workshop was a surprise present by my boyfriend. It was such a joy. Wonderful tuition and fun making a pot. Looking forward to get it in the future. Odile was the perfect host and great teacher. Despite me being complete a complete beginner (with no hidden talents on the wheel) she was patient and helped me each step of the way. A great way to try something new! Highly recommend - would do again! 5 stars for the class and the teacher. I went on my own and had such great fun. The teacher is amazing and so super talented. Had a great time at the Wheel Workshop! Very informative and fun, and the small group helped to make sure I/we had individual attention and help. It was a lovely 90 minutes, and I can't wait to see my "bowls" in their finished product! Thank you Odile, you were lovely and very helpful! Odile was such an amazing teacher and very kind throughout. She made us all feel very comfortable and encouraged us to keep persisting with our throwing techniques even if we were struggling. Wonderful workshop, definitely recommend and well worth the money! I had a great time! Odile was lovely, really helpful and patient. Would go again! Oddie was great! I arranged this workshop for my partners birthday and we really enjoyed it. I'm sure we'll be back soon. The class was wonderful and so was Odile! 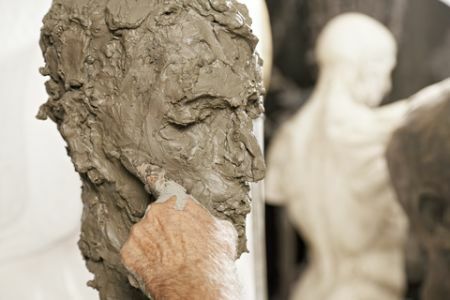 The step-based approach to using the wheel and preparing the clay was concise and useful when put into practice. Odile was unendingly patient with a first-time wheel-er like me, and her love of clay and of teaching her art was a joy to experience! Thank you, Odile; I can’t wait to come back! 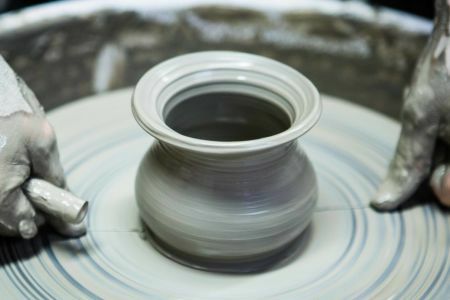 An excellent introduction to the pottery wheel! Odile was a brilliant, patient teacher who taught us the basics and aided us in producing our bowls. Nice , accessible venue. We went to Odile's class as a group of 3 for one of the girls birthdays. We all had a wonderful time! Odile is super friendly and very good at walking you through the process of making your first piece. We only wished we could have stayed all afternoon and kept playing. It was a lot of fun. Thanks Odile!! Excellent facilities. Friendly and highly skilled teacher. Small group of 3 students. Thoroughly enjoyed my first pottery class. Thank you! Odile is a great teacher but I would recommend booking a workshop for 2 hours. Great course awesome teacher and good taste of pottery on the wheel! Fantastic workshop, couldn't have asked for a better instructor or experience. Would recommend to anyone!!! Our pottery class was so much fun, the only thing I regret is not booking a longer class! Odile was very calm and taught us the ropes, always on hand to help when anything went wrong! Now we want to book more! Odile studied chemistry, but fell in love with pottery after trying some evening classes in Farnham. After learning to throw and run a studio by working with other artists, she decided to set up her own space in West London which she runs with her partner Kieran. Their studio is in a beautiful old Victorian school building in Maida Vale which houses 150+ artists and creative makers. They've invented many of the tools, teaching aids and techniques they use at the studio and are constantly experimenting with new ideas and processes. You'll have everything you need waiting for you at the studio, including refreshments, lockers for your possessions and room to change. You'll be sitting with a wheel between your knees, so you'll find shorts or trousers more practical than a skirt and it's good to wear clothes you don't mind getting a bit of clay on (which washes out easily). You'll also find the project easier if your nails are well trimmed.